Voltolini, Benedetta. “Non-State Actors and Framing Processes in EU Foreign Policy: The Case of EU–Israel Relations.” Journal of European Public Policy (early view; online first). 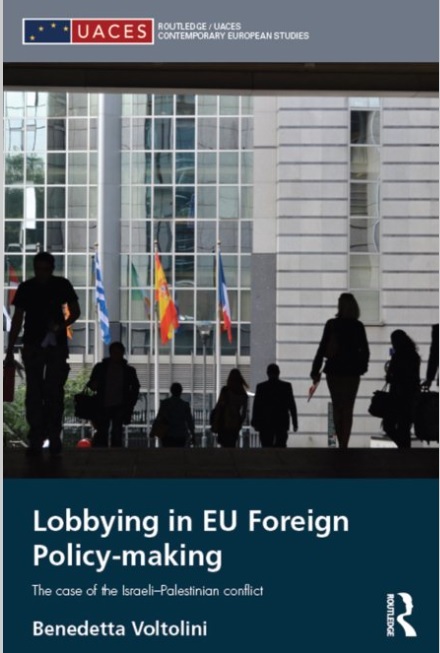 This article investigates the role of non-state actors (NSAs) in European Union (EU) foreign policy, focusing on how they contribute to the emergence and codification of new frames that underpin EU external policies. It argues that changes in EU foreign policy are the result of interactions among a frame entrepreneur, often played by an NSA, and policy-makers in situations of cognitive uncertainty and when a policy window opens. The empirical evidence is based on the case of EU–Israel relations: a non-governmental orgaization (NGO) called MATTIN Group acted as frame entrepreneur and contributed to the emergence and codification of a new frame of understanding of EU–Israel relations, redefining them on the basis of a legal paradigm. This clarifies the territorial scope of bilateral agreements and ensures that the bilateral relations are constructed and implemented in accordance with EU legal framework and its commitments under international law. Voller, Yaniv. “From Periphery to the Moderates: Israeli Identity and Foreign Policy in the Middle East.” Political Science Quarterly 130.3 (2015): 505-35. In short, then, aspects of continuity in Israeli foreign policy have been far greater than what most analysts and commentators have assumed. Even more importantly, they have been as great, or even greater, than aspects of change. The moderate axis conception has meant that different actors now assume different roles—past radicals have now turned into the moderates. The center, in turn, has been occupied by a new force: radical Islamism. This new threat has steered the Middle East into a new era of uncertainty and struggle. Nonetheless, the essence of the periphery doctrine has survived the transitions. In spite of shifts in the regional balance of power and the new political dynamics, of which Israel has been an inseparable part, Israel still views itself as a peripheral actor, facing constant pressures from the center. The moderate axis conception embodies this as the moderate regimes have come to be seen in these terms as well. The still-unfolding events of the Arab Spring mark a turning point in regional geopolitics. As violence still rages in Syria, and as the Egyptian army struggles to consolidate its power vis-à-vis the various Islamist factions in the country, it is still hard to envision the future political map of the Middle East. Nevertheless, we can assume that some important changes may take place. Israel may be slow to respond to such changes, as happened in the transition from the periphery doctrine to the moderate axis conception. Or it may learn the lessons and quickly reassess its old commitments and agendas. If there is one thing we can learn from Israel’s policymaking and its responses to changing regional threats, it is that the actions and decisions of Israeli foreign policymakers will continue to be percolated through its identity and self-perception. Whether these are going to change is as difficult to determine as the future of the Middle East. The Council for British Research in the Levant is pleased to open a call for papers and posters for a two-day conference to be held in London with the LMEI to showcase the work of CBRL and its partners in the region. The conference will present sessions on a number of themes linking the past to the present day in the Middle East. The CBRL is the British Academy-sponsored organization that promotes, sponsors and carries out high-quality research in the humanities and social sciences throughout the countries of the Levant. Please circulate to all interested colleagues. אורן, יצחק. לדוג עם הנשיא. עלייתו של הספין הדיפלומטי. תל אביב: רסלינג, 2014. Yitzhak Oren’s book examines and analyzes four dramatic events in the relationships between Israel and the United States towards the end of the 20th century, in which the diplomatic spin dominated the chain of events: the loan guarantees crisis, Israel’s willingness to attend the Madrid Conference, the deportation of Hamas leaders, and the receipt of the loan guarantees, accompanied by a journalist speculation about “fishing with the president.” The book further diagnoses and proposes the characteristics of the diplomatic spin as a new and fascinating theoretical field. The author adds to these case studies his personal perspective, as one who experiences the events from within the Prime Minister’s office. Dr. Yitzhak Oren teaches political science and public diplomacy at the Academic College of Emek Yezreel and Haifa University. In the past he was a political advisor to Prime Ministers Yitzhak Shamir and Yitzhak Rabin, as well as an envoy for US congress matters at the Israeli Embassy in Washington, D.C. and an Ambassador in Nigeria. Lustick, Ian, Yousef Munayyer, Jeremy Ben-Ami, and Ahmad Samih Khalidi. “Symposium: Two States or One? The Future of Israelis and Palestinians.” Middle East Policy 20.4 (2013): 1-28. Hermann, Tamar S. The Israeli Peace Movement. A Shattered Dream. Cambridge: Cambridge University Press, 2009. Steinberg, Gerald M. “Review.” Middle East Quarterly 17.3 (2010): 81. Gidron, Benjamin. “Review.” Shofar 29.3 (2011): 180-182. Darweish, Marwan. “Review.” Peace Review 23.1 (2011): 123-126. Hrynkow, Christopher. “Review.” Peace & Change 37.4 (2012): 609-611. Haas, Mark L. “Missed Ideological Opportunities and George W. Bush’s Middle Eastern Policies.” Security Studies 21.3 (2012): 416-54. Numerous analysts have criticized George W. Bush’s Middle Eastern policies for their strong ideological content. This article agrees with a core premise of these critiques, but it does so for very different reasons from most analyses. Ideological rigidity on some issues, paradoxically, prevented the Bush administration from taking advantage of the full range of ways in which ideologies shape international relations. There were three major opportunities to advance US interests in the Middle East during Bush’s presidency that were created by the effects of ideologies. First, liberalizing parties in otherwise illiberal regimes tended to be significantly more supportive of US interests than other ideological groups in the same country at the same time. Second, major ideological differences among different types of illiberal enemies of the United States enhanced America’s ability to adopt “wedge” strategies toward various hostile coalitions. Finally, the existence of different types of ideological enemies in the Middle East created incentives for some illiberals to align with the United States because of mutual ideological enmity for a third ideological group. The Bush administration, however, failed at key times to take advantage of these openings. If Bush administration officials had been less ideologically dogmatic while, somewhat paradoxically, making better strategic use of ideologies’ major international effects, America’s security would have been significantly advanced in critical cases.